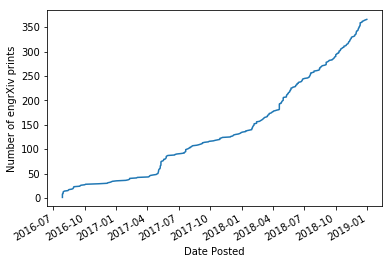 We are well into 2019 now and the rate of submission to Engineering Archive continues to increase (check out our stats!). With this increased submission rate, we have also seen an increase in spam. We try to catch these as quickly as possible and remove them, but using a post-moderation process means that the spam gets shared publicly on our social media accounts before being caught. Therefore, to help mitigate this, we will be shifting Engineering Archive to a pre-moderation process. This means that all submissions will be reviewed prior to being publicly shared. This will result in a small delay between submission and public availability/social media sharing, but we will work to keep this delay to a minimum. At the same time, we are rolling out a new feature which will allow authors to request withdrawal of posted preprints. While we expect these requests to be rare, there are circumstances where it is appropriate to take down a preprint in order to comply with copyright policies and other requirements. When the request is made, authors will be asked to provide a reason for the withdrawal which will be reviewed by a moderator. Once the withdrawal is processed, the preprint file will be removed and it will be replaced with a page containing the title, authors, and reason provided for withdrawal. This page will serve as a landing page for any future visitors looking for the preprint. More information about this and other Engineering Archive policies can be found on our guidelines page or our FAQ page. Happy preprinting! At the end of 2017 there were 136 articles posted on engrXiv. As we close out 2018, engrXiv is now hosting 366 articles with more being uploaded all the time. 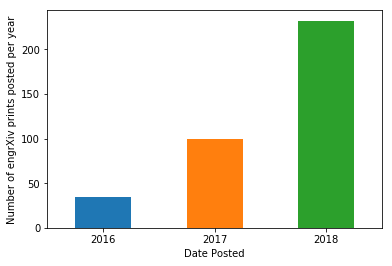 This means that more articles were posted in 2018 (230 in total) than in the entire previous existence of the archive! Growth of the submission rate continues to be strong and we expect this growth to continue into 2019. This year we also added hypothesis integration to engrXiv which allows for the addition of comments and annotation directly on preprint files using the W3C web standard protocol for annotation. We also saw a small change to how supplemental files are surfaces on preprint pages. The link is now displayed right at the top of the page, making it easier for visitors to your preprint page to find additional files associated with the preprint. This link takes visitors to the OSF project page associated with the preprint if the project page exists. On the horizon, we expect to launch the display of view counts on preprint pages in 2019Q1. This metric is widely used to demonstrate impact of a work alongside download counts. We hope you’ll join us in continuing to grow engrXiv in 2019 and make more of our engineering scholarship accessible and available to all! As always, in addition to posting your work, you can help contribute to the development and growth of engrXiv through one-time or monthly donations. See our donation page for the various ways in which you can make a financial contribution. Engineering Archive is now integrated with Hypothesis, a third-party annotation tool that allows you to annotate preprints and provide feedback to the authors. The partnership builds on the foundations laid by the publication of web annotation as a standard by the W3C, the pioneering work by Hypothesis to build an open annotation infrastructure and by COS to offer OSF as a comprehensive platform for open scientific research and publication. Once you set up a Hypothesis account, you can read, create, and reply to annotations and page notes through a simple interface directly over the preprint file itself. Readers will be able to make public annotations, private notes, or create collaboration groups. Annotation on preprints will increase transparency in scientific practices by enabling researchers to collaborate, discuss research with peers, and share additional information directly on preprints both before and after they are posted. We think this will be a useful tool to help gather early informal feedback prior to publication. This early feedback is one of the real strengths of preprints! You can see an example of Hypothesis annotation on this preprint.